He wears metal framed glasses. He was last seen wearing a black t-shirt with "CSI" in green letters and a handprint graphic. Kyron was also wearing black cargo pants, white socks, and black Sketchers sneakers with orange trim. Kyron is allergic to bee stings. Unknown. Kyron's photos are shown age-progressed to nine years and 14 years, respectively. 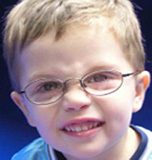 Kyron has been missing from Portland, Oregon since June 4, 2010. He was last seen that morning after attending a science fair at Skyline Elementary School. His step-mother was the last to see him before he reportedly disappeared from the school just minutes before school started that late spring morning. He has not been seen since, and his case remains unsolved.